1) Have a driving license issued in European Union Zone. 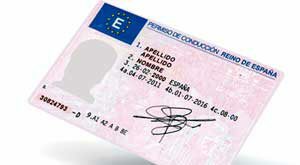 We recommend to get your national driving license translated by an official translator into Spanish. (You can do this with any Spanish translator who is qualified to translate and stamp official documents from other countries. We can do it for you, need 24 hours. in this case contact us). You are still able to rent in Vespa Soul Barcelona without an international Driving Permit or an official translation and be covered by our third party insurance. However Vespa Soul Barcelona will not accept any responsibility for any potential fines or costs incurred.